At the ‘Save Democracy’ rally, Sharad Yadav said the government had failed to keep its promises and the time had come to ‘show the doors’ to the BJP. 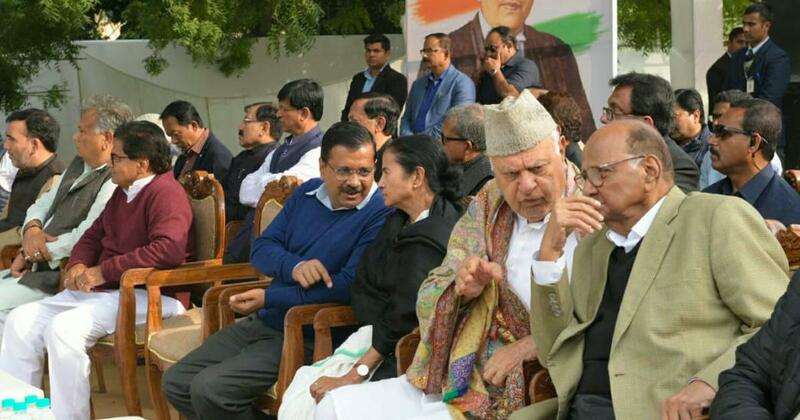 Opposition leaders gathered in Delhi on Wednesday to attend a rally organised by the Aam Aadmi Party. The “Remove Dictatorship, Save Democracy” rally led by party chief and Delhi Chief Minister Arvind Kejriwal was organised at the Jantar Mantar. West Bengal Chief Minister Mamata Banerjee, National Conference leader Farooq Abdullah, Nationalist Congress Party chief Sharad Pawar, Loktantrik Janata Dal chief Sharad Yadav, and Communist Party of India (Marxist) leader Sitaram Yechury were present on the stage along with Kejriwal. Congress leader Anand Sharma was also seen on the stage. Banerjee said the situation in India has become worse than that under an Emergency. The West Bengal chief minister accused the Centre of interfering with the CBI’s functioning by ordering the interrogation of the Kolkata commissioner. “It is prime minister’s last day as elected leader in Parliament today,” she said referring to the end of the Lok Sabha’s 16th session. “Everyone is afraid of Gabbar Singh [a fictional villain]. There are two of them.” Her jibe was an apparent reference to Prime Minister Narendra Modi and BJP national President Amit Shah. Yadav said the government did not spare anyone, be it party leaders or institutions like the Central Bureau of Investigation. He said unemployment will no longer be a problem if a new government is elected. The Aam Aadmi Party’s rally comes a month after the Trinamool Congress organised a massive Opposition unity rally in Kolkata. The BJP described the rally as a “desperate attempt to hog the limelight”, PTI reported. West Bengal BJP president Dilip Ghosh accused Banerjee of leaving the state’s administration in the hands of her party colleagues who are “looting West Bengal” while she attends the rally. The BJP’s West Bengal chief said the Opposition is desperate for power. “The more these parties organise such rallies, the more it will be clear that opposition leaders are rudderless and are afraid of Narendra Modi,” Ghosh said.